Recently picked up a “Phillytablet” from the local newspaper publishing group, Philly Media Network (PMN), publishers of the Philadelphia Inquirer, Daily News, and a few other smaller news publications. The pricing is structured with two options. The first is to buy the tablet for $99 and pay $9.99 a month for the e-editions of the newspapers for 2-years. The second is to pay $129 for the tablet and agree to a 1-year subscription at $12.99/mo. If you decided to buy this tablet without the deal, it is currently retailing for about $221, but it is not quite available yet from general retailers. A lot of misinformation has been going around saying that it is available for $170, however this is for an older model and isn’t accurate if you are making that comparison. The newspaper wants you to believe you are receiving a savings over a regular newspaper subscription. If you work it out over the term of the contract and discard the value of the newspaper, it costs $338.76 for the 2 year and $284 for the 1 year deal. Obviously if you aren’t going to use the newspaper portion, it isn’t worth it to agree to this deal. I am going to review the PMN portion of the device separately from the hardware, because they are really two separate things. Also of note, this is my first Android device. I’ve used Windows Mobile in the past and I’ve been an iOS fan for the past few years but have been wanting to dip my feet into the Android world for a while now and thought this would be a good chance to do so. Click here to skip to the Philly Media Network apps review. The tablet itself has a solid feel to it. It is mainly plastic but is sturdy enough to not seem flimsy. There is a camera on the front and none on the back – and the front-camera is of low enough quality that it isn’t going to be good for much more than video-chatting. It came with Android 2.3 installed on it, as well as a few apps and shortcuts. Specific to the Phillytablet are a few apps I will describe in further detail below. The 10″ screen itself is bright and of decent quality. It has a more rectangular shape than the iPad, which does lend itself to reading a newspaper or a lot of text. Battery life, from what I can tell so far, is also good on this tablet. I did notice that it does not charge via the included USB plug, you need to use the proprietary power adapter to do any charging, so I was a bit put off by that. USB is so prevalent, all devices/gadgets should charge via this method. The lack of a dual-core processor was definitely visible at times. Angry Birds took a few seconds to get running smoothly, but after that it seemed to run OK. Any website that included Flash was visibly slow and movement was jerky. Reading a book via the Amazon Kindle app was OK, there was a little delay while paging but it was tolerable. If I had to guess I would say that this device suffers a bit both from not enough CPU power and also latency while reading/writing to memory. All said, it is a decent device for the money. 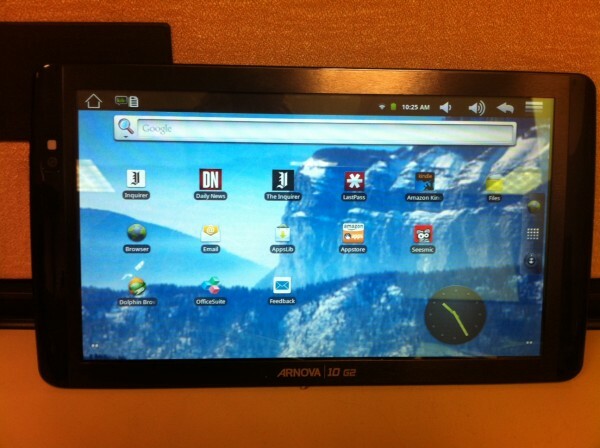 I would not describe this as a “top tier” tablet as some PMN executive will tell you, but it isn’t bad for the price. Since I’m new to the Android world, I’m also new to this market fragmentation I’ve heard so much about. And it is ugly. So for non-Android people, I will give you the short and quick version as I know it, please feel free to correct me if I am wrong. Apparently Google only allows access to Android Market on some devices, and this tablet is not one of them. To try to correct this, Archos (the parent of the Arnova brand) created an App store called AppsLib. They also included the Amazon App Store on the tablet. Each store does have tons of applications, however I found some major gaps. You want Netflix? Nope. Skype? Nope. BeeJive? Just the Facebook version (?) for some reason. It appears that some application developers choose to only release to certain stores, and access to those stores is restricted. I’ve heard that you can root your device and add some custom ROMs which then give you access to other stores, but haven’t gotten that far yet. Yet for some reason, AppsLib offered Angry Birds for free (add supported). I can’t really figure it out, but I can tell you the separation of apps stores is definitely a cause of confusion for consumers. Notably missing was Google Apps and other cool toys you often see on other Android phones and tablets. It does include a browser and some apps are available via the Amazon store, including Seesmic, Kik and more. So now that we’ve determined that you should only buy this device if you want to receive the subscription to Philly Media Network, what do you get with your subscription? When you receive your device there are several pre-installed apps from PMN. 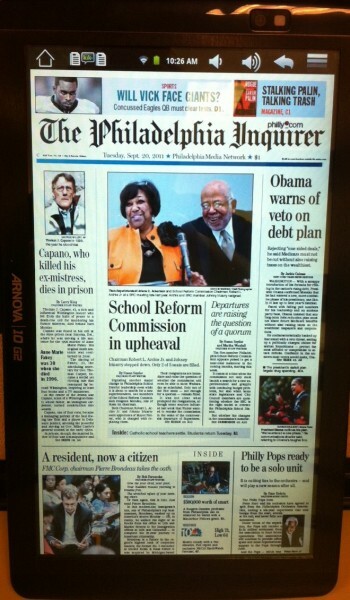 One is a link to the online tablet version of The Inquirer. The second are two ‘e-readers’ for the digital versions of the print layout of the Philadelphia Inquirer and the Daily News. The rest just seem to be bloatware to me – advertisements (links to websites, basically) to Main Line Health, PMN, Dealy-o and Philly.com. So the real thing you are paying for are the subscription to the 2 e-reader apps for the Inq and Daily News. There are a few things that I do like about the apps. It’s nice that it will automatically download the papers while you are at home, and you don’t need the network to read them as you travel on your way to work. I take the train and the reception from AT&T is, let’s just say, unreliable. Using the paper app you can read through the paper just like the print version. When I was a print newspaper subscriber, I liked reading the paper, but disliked all of the trash it generated. This is also a great way to reduce paper consumption and reduce distribution costs for the paper. Non-specific to the device, the UI of the app seemed to be a bit confusing to me. You supposedly have the ability to click on headlines and be taken to a text-version of the article formatted to read on your screen. It only worked about half the time for me, I think it has to do with where the main text section was located. Hopefully this is just a bug they can iron out. Sorry of this gets a bit philosophical for you, but I think there is a place for old-school journalism. It’s not about local news, if I want tidbits of local information I’ll check Twitter or Facebook. I like old-school journalism because it gets me in-depth coverage of local-ish news items. Blogs have their place too, but I attribute their success to a different area of the brain. It’s the same area that OK or People scratches – breaking news, gossip, and ‘eye catching’ headlines. Having written for some major blogs – Lifehacker and MakeUseOf, it is amazing to see how much of the success of a blogger is attributed to the eye-catching quality of the title of the post. It takes one read through comments and you can tell that many do not even read the actual content, they read the headlines and form an opinion. Newspapers are good, on the other hand, at really getting into the issues. They interview local people and analyze the issue much more than any blog that I’ve known. The problem with newspapers is that they are trying to emulate the success of blogs. Instead, they need to focus on what they are good at – in depth coverage of local/national news, and bringing that to its audience in as user-friendly of a way as possible. An e-Newspaper does not do this. I think The Daily is probably the best example I’ve seen of a newspaper making this transition the right way. Focus on the app. Creating version of the newspaper that is exactly like the paper version is not going to win you any subscribers. Want to reach us in the digital age? We might have a shorter attention span but we still value good content. 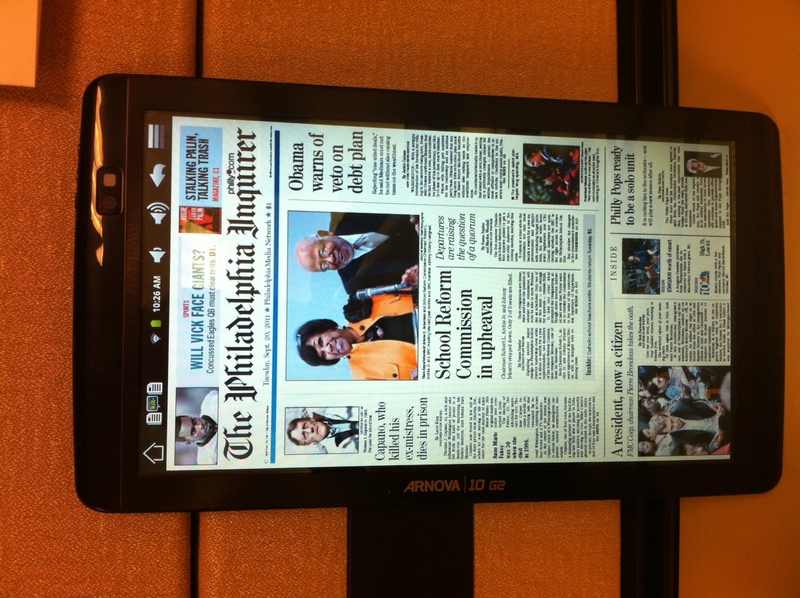 Will the Phillytablet be a success? This is certainly a tough call to make. I want it to work. Journalism as a whole has been under fire and the whole reason I gave this deal a shot – besides having the tablet itch for a while now – is that I want it to succeed. I’m probably the ideal customer for this tablet – my train commute giving me ample reading time – and I’m a news junkie to boot. I just don’t see this being a long-term viable winning strategy for them. I think they are concerned that not enough people have access to tablets in order to get the e-edition of the paper. As we’ve seen tablet prices drop, I think if someone wants a tablet, they are going to buy one and this isn’t going to be a barrier to adoption of an e-newspaper. The barrier to adoption is that reading a full-version newspaper on a tiny device is never going to be as a fulfilling experience as holding out crisp newsprint. To illustrate my point, I paged sadly by the crossword and sudoku puzzles. We used to get the physical paper just so that my wife could do those every week. With the e-edition, you can’t play them at all. What can the Philly Media Network do to turn things around? First of all, I think they need to drop the Phillytablet initiative and focus on content and delivery across all platforms – iOS, Android and Web. If they want to offer a tablet, give it as a gift if someone subscribes to the paper for a year or 2. They should be giving online access to everyone with an interest in the content, not just subscribers to a physical or electronic paper. Also, they need to get with the times on the ordering process. You had to call a phone number to order the Philly tablet. You couldn’t order it online or pick it up in their store. This goes the same with their newspaper subscription, and in this day and age is a major drawback to adoption. So, I’ve certainly been wrong before but I am curious about your thoughts. Do you think the Phillytablet has a shot? What is the future of print newspapers? I got this deal and I have to say I am deeply disappointed. I will be returning the tablet once I get the email on how to do so. The absence of the Google apps and the inability to add it was the last straw for me. I fumbled through the thing, but I just can’t do it anymore. I am going to return this, cancel the subscription to the Inquirer and Daily News and go get an IPad. Sad, cuz I really wanted this to work for them. I just unboxed the “PhillyTablet” last night and played with it for about an hour – I was setting it up for my father, who is going to try to make the switch. I think your review is pretty spot-on. I only have one significant worry that I’m afraid may turn my father off to the device – which is the problem you mentioned in trying to click on headlines when reading the newspaper. I will go into that below. My initial reaction upon bootup was that the display wasn’t outstanding and its colors changed depending on viewing angle. However, when viewing the two newspaper apps, both text and images were clear, bright, and readable. So I was content with this aspect. The touch sensitivity was very good. Navigating through menus and scrolling through text was smooth and on par with your standard Droid phones on the market today. I was impressed with the video when I went to YouTube via the browser. Video loaded quick and looked nice in full screen mode. That was honestly an unexpected surprise. The first newspaper reader I tried was the Daily News app. I must say that I was impressed. I enjoyed scrolling through the pages, zooming in and out, and clicking on the headlines to view the text version of the article. Clicking on the headlines worked flawlessly in the Daily News app. However, not so much in the Inquirer app. The Inquirer app works in the same fashion as the Daily News app, except for the inability (in my case, about 90% of the time) to click on the headlines to enter the text mode. I attempted for about 30 minutes to find a work-around to this problem. When you attempt to click the headline, instead of entering text mode, it will just bring up the status bar showing which page you are on. I found that if you double tap the page you are viewing to enter the zoom mode, the success rate of clicking the headline increases – to about 40% maybe? OK, so I can deal with entering zoom mode first, but I want to increase my rate to near 100%. I thought maybe there was some lag, so after zooming I would count to 5 seconds in my head. This worked sometimes but not always – no luck there. At this point I was becoming increasingly frustrated, so I gave up for the night. I can only think that maybe I need to quit some processes that are running in the background, but I didn’t get the opportunity to toy with this yet. Also, if this works, will I be able to explain this to my dad? I haven’t handed it over yet to him, but I am afraid that this one flaw will deter using the device. It makes me wonder, with the newspaper readers being the main focus of the tablet, how this could get past testing. I really hope they are able to fix this issue or provide some feedback, otherwise I may box it up and ship it back. General comment about the Systembash site: It’s pretty tough to read the comments due to the font, size, and color. Thanks for your input Mike! I had about the same experience with the headline bug. However, this seems to be software based and therefore should be able to be fixed. To bring up an article in text mode, try clicking on the right corner of the blue highlighted headline. That works most of the time. Thanks, I’ll try when I get home. does the screen rotate on anyones philly tablet. i went into settings and clicked it on but it does not rotate.. do i have a defective one or doesn’t this models screen rotate. Sounds like yours is defective, my rotates out of the box. In order to read the paper i will need a stand from a case. Any recommendations? I’m curious, what happens to coupons and ads? I too bought the Arnova 10 G2 whilst in Hong Kong, I was talked into it after wanting to buy an Ipad 2, I stupidly let them talk me into it thinking it was going to be better, there claim was that you could download games and books free where on the IPad you had to pay for them, I have since been told some are free on the IPad too. The thing that urks me most is that I cannot open anything now, all I get is the word ARNOVA on the screen for a couple of seconds then nothing. I have sent two emails to the company but have not received an answer as yet. If anybody can tell me what to do I would appreciate it. How long should I let this tablet charge before using it. I just got one today and It would come on and It seem as if it does want to charge. I hate that I had to snap the USA plug on…I just want to see if it will work…Can anybody Help me with getting it Charged up???? Has anyone found an app that lets you stream movies and tv??? I have netflix from the amazon store, (didn’t offer it to the fire came out go figure) and it’s running great look for alot more of your favorite apps now that amazon has thrown it’s own hat into the tablet arena. Cwing, there is a reset switch behind the very tiny hole next to the power plug. It looks like you need a needle or something else really skinny, but stiff enough to press the button inside. My guess is that it will reset the machine back to factory fresh state, and you will likely lose all your pictures and Email, and any apps you installed. But you have nothing to lose. So Damon, you are using the Netflix service on the Arnova 10 G2 Tablet? Did you have to do anything out of the ordinary to get Netflix to run on it? Thanks. Since you’ve had this unit for a couple of months, I’m just wondering if you have any additional comments, suggestions or tips. I just ordered the unit as part of the newspaper special, and I’m wondering if I’ll be able to use the tablet for other things, like email – using a basic browser, Netfilx, etc. Does the operating system give you the ability to type – like with a virtual keyboard interface, for email? Thank you. Hello Garth, Just wondering if you’ve been able to figure out a solution to your issues. Thank you. After the Amazon Fire Kindle came out, Amazon has been adding a ton of new apps to the Amazon app store. The Netflix app was a welcome addition – and it works great on the Phillytablet (Arnova 10G2) Didn’t have to do anything special, just install it from the Amazon App store. I cannot find a contact for Archos online for the problem either? thank u much! Okay, so I got one for Christmas. Took a week to finally get the Appslib website on my computer because it was “down for maintenance”. I have no troubles as far as touch screen (very sensitive and to Rose, it can be calibrated to how sensitive you want it to be..it shouldn’t “hurt” any fingers. Yes, there is a touch keyboard, just have to tap the box into which you want to type. My charge is okay, my screen is sharp and clear, it rotates fine (and yes it does rotate with movement). So here is my most major issue and hence it will likely get returned–by following the instructions, I connect my Arnova to the internet via the USB to my computer. Go to Appslib (that is finally back online) and hit download on a simple and free game. What do I get???? MY DEVICE IS NOT COMPATIBLE WITH APPSLIB! No further instructions, options or otherwise. No way to call tech support, because OMG! they don’t have a phone number! Appslib is run out of HONG KONG…not even calling there. And Arnova offers no local or 800 number either. We updated the root thing…my son’s the techie one and BAM! there goes my icons. Had to find the file and reinstall them…just to get that my Android run, Arnova based “PhillyTablet” is not compatible with any thing. So, I’ve gotten on Facebook once, my email several times because it will tell you that you have to have a GMail account LINKED to an Android Mobile service. Now, I don’t have a cell phone, don’t want one. BUT my son does and to no avail even using his account…NOT COMPATIBLE! Reset it, didn’t help. Just wondering…ANYONE else with this problem or who can offer advise!? Thanks! Thanks Dave. I tried to download the Netflix app, but I had trouble navigating to the point where I could sign in and download it. Is there a trick to installing the Amazon Netflix app on the Phillytablet? Nope – seemed very easy to run. What issue are you running into? specific for newspaper reading, and it works well enough. full spectrum sound coming out of speakers from any tablet of this type. The unit easily hooked into our home wireless network. All in all, a relatively decent value for the money. I don’t like the seperations of the app stores, I have this device and I am unable to get hbo go and Skype! Ugghh! It has run out of batterys you need to charge it its the hole in the bottom left corner DO NOT USE THE TOP HOLE IT WRECKS THE CHARGER CONNECTION THINGY AND THE HEADPHONE JACK!!!!!!! !